I have been wanting to try the layering technique using Framelits for quite some time. It is such an easy technique too. You just lay all your Framelits, of like kind (hearts, circles, whatever), and run them through the Big Shot twice, using different paper each time. As my daughter says, it gives it almost an optical illusion using such bold papers. I would imagine using similar colors the effect would be much more subtle. I like the crisp clean colors of this card. Graphic might be a better description. 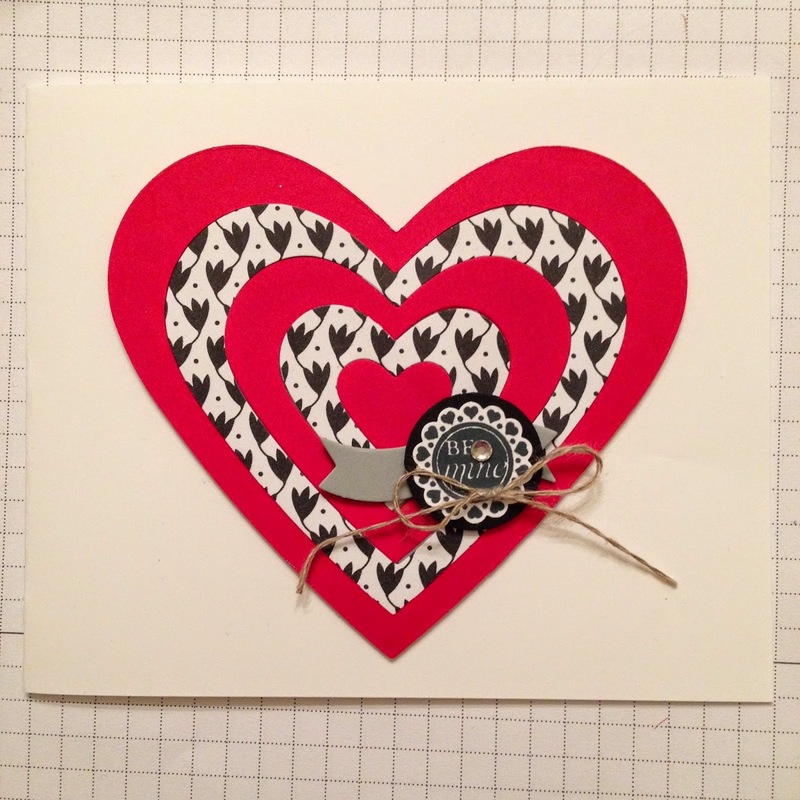 Because the focal point is the layered heart I chose to keep the background and the greeting vary simple. Anything else and it just gets lost in that bold heart, or would look just to darn busy. Have you started working on your valentines cards yet? I am pretty excited for the day for the first time in my life. It is not a holiday that has ever risen high on my list because it really is a one day holiday, a Hallmark holiday, as I like to say. Great for sending cards, remembering loved ones, but not much significant purpose outside of that. Okay, some people like the chance (excuse) to eat chocolate. Me, not so much. This year my husband and I have a date. A real honest to goodness date. It is just a coincidence that a concert we wanted to attend fell on February 14th. We are going to go to dinner, really early in the day to avoid the dinner rush crowd. It looks to be a promising evening. We rarely go out as a couple, rather focus on family activities. I might even buy a new dress, if I get the time to shop.